The White-winged Widowbird would be on no one's list of species likely to be undergoing a range expansion. But all the BLUE quarter degree grid cells in the Free State represent places where it HAS been recorded in SABAP2, ie since 2007, and where it was NOT recorded in SABAP1, ie before 1991. The SABAP1 data for the Free State is high-quality â€“ it covers the nine-year time period 1983â€“1991, because it also includes all the data collected for the Free State atlas project, which ran from 1983 to 1986 (and for which there is a published book). The Free State atlas shows the species only along the Vaal River and along the eastern high altitude grasslands. So we can be pretty certain that White-winged Widowbirds were vagrants over the bulk of the Free State prior to the 1990s. 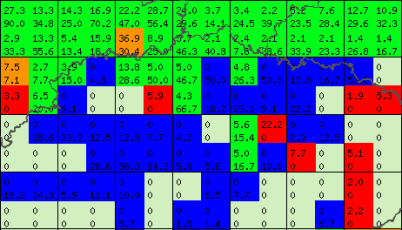 The smaller map below shows the actual reportings rates in SABAP1 (the top figure in each grid cell) and in SABAP2 (the bottom figure). The top two rows in this map is the region between 26Â°S and 27Â°S, the northern edge of the grassland. The reporting rates in all except one of these quarter degree grid cells have increased, and many of them have increased from figures below 5% to figures above 20%. The southern edge of the map is at 30Â°S, just south of Bloemfontein. 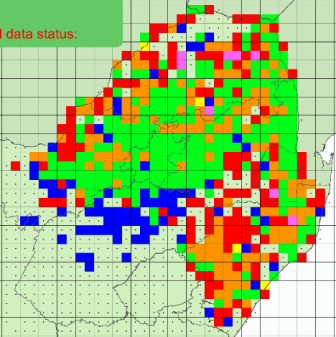 The SABAP2 reporting rates in the new (BLUE) range in the Free State are frequently above 10%, so the species can no longer be considered a vagrant over much of this area, which has been well atlased! Brian Colahan, Ornithologist for the Free State's Department of Economic Development, Tourism & Environmental Affairs, comments: "I've always considered this species to be dependent on rainfall â€“ it prefers ranker grass which grow when there has been above average rainfall, and it expands its range southwards to take advantage of this. I've presumed that when conditions are not so good, its range shrinks." Rick Nuttall, Director of the National Museum in Bloemfontein, says: "I concur with Brian in that these birds seem to move in after good summer rains. It would be interesting to investigate just HOW wet the summers have been during SABAP2 compared to SABAP1. Our Birding Big Day team, which centres birding effort around Bloemfontein, recorded White-winged Widowbird in 2006, 2007, 2008 and 2009, but not in 2005 and 2010 (which was very dry at the time)." The pattern of annual distribution is clearly quite subtle. So here is a project for someone! How is the occurrence of White-winged Widowbirds related to rainfall? SABAP2 will be able to help tell us the answer. But only if the atlasers of the Free State faithfully go out and atlas their pentads on a regular basis. So this is the ongoing plea to atlasers everywhere â€“ Please go DEEP in the pentads which are easily accessible to you. You might not easily be able to spot the patterns your own checklists are showing. But put together with the data collected in neighbouring pentads, the fascinating pictures start to emerge.